A friend of mine works with Barefoot Books and she told me about some great deals they are having right now. What is Barefoot Books all about? "It’s exploring other cultures, our planet, ourselves. It’s making time for make-believe and letting imaginations run wild and free. Most of all, it’s about using the power of stories to nourish the creative spark in everyone and strengthen connections with family, the global community, and the earth." Order today (Dec. 15th) and get guaranteed Christmas delivery! FREE SHIPPING on all orders over $60. No coupon needed. Other sites charge $5.95-7.95. Current Valid Coupon Codes: GLOBAL = 30% OFFor AMBTWY = 20% OFF. Both exp 12/31 and can only be used by each person once.They can not be stacked but are valid on sale items! Disclosure: My friend gets commission on purchases through the above link. If anyone makes a purchase through the link in this post, she'll share her commission with me. Are You Ready for Black Friday 2011? I can hardly believe it's almost time for Christmas! The good news is that the ads are already starting to emerge, and moms, like me, can begin checking out the deals and taking notes. JC Penney, Hastings and Costo already published ads, which you can find here. If you want to stay on top of everything Black Friday related, you'll probably want to check out BlackFriday2011.com. Also, I found this really cool info-graphic which shows History’s Hottest Holiday Toys from 1903 to 2010. It's pretty cool to see the most popular toys dating back over 100 years. Tip: Just click on the image below and you'll be able to click on the original post to enlarge the font and images. You can impress your friends and family with random Christmas trivia like... Did you know that in 1957, the Frisbee was all the rage? 1) They say ALL orders over $49 ship FREE! * Shopping online is always more fun when you don't have to pay those pesky shipping fees. 2) I was also able to use the coupon code "fabulous" for an extra $1 off, which made this only $9. And, this coupon code looks like it's valid until February 2012. Kids literally stomp on the launch pad which blasts air and propels the Stomp Rocket up to 200 feet high into the the air. It's the type of toy that many parents love as much as the kids. Plus some teachers use it to teach children ballistics, projection, force, and motion. And, it's battery free! Being a mom of 2 boys who LOVE to play outside, this was on the top of my Christmas shopping list. I've seen these stomp rockets in action a few times, and kids go crazy for them. They are so simple, but shoot so high into the air. It might be the type of thing you have to see to understand. Maybe the kids I know are just easily amused, but, I've never seen a kid who wasn't fascinated by one of these things. They are fun, fun, fun! *See YoYo.com for details / Referral link above. September 6 – 10, 2011 Participating Chick-fil-A® restaurants are giving away a variety of FREE breakfast entrées to customers who make a reservation online. Click here to find a participating location and make your reservation. Redbox and Blockbuster Express are two of the most popular brands. 1) On August 25th, Redbox has declared it to be America's Movie Night. Just go to Redbox's Facebook Page and "like" them. Then, click on the "America's Movie Night" tab and you'll have the option to get a free rental for yourself or send one to a friend. Code will be valid on 8/25 for a 1-night standard DVD*. You can also go to InsideRedbox.com and look for additional promo codes for a free rental. Or, try searching Google "Blockbuster Express Codes". The rentals are usually inexpensive anyway, but free is even better! *As usual, check the details and read the fine print for this and any other promotion. There's a great deal from Mamapedia that I wanted to share with you. A one year subscription to National Geographic Little Kids magazine is being offered for $10, plus, you can get an additional $3 off with the coupon code NATGEOLK3, which brings it down to only $7! 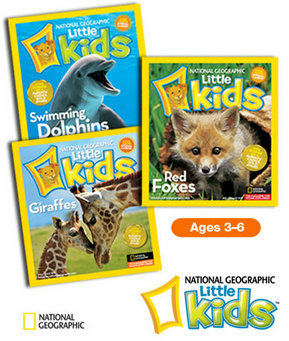 "Give your little explorers a head start with a subscription to National Geographic Little Kids. Winner of a Parents’ Choice Gold Award for the past four years, it’s specifically designed for preschoolers. BONUS: Each issue includes FREE animal cards!" Click here to go to the Mamapedia website and get this deal! Offer valid only August 18-23, 2011 * Be sure to read the details and fine print that apply to this Mamasource deal. The link included above is an referral link. Looking for a special gift? Shop & Donate to a Good Cause. I hope you're having a wonderful weekend! I know a lot of people are very passionate about adoption. So, I wanted to let you know about a special fundraising effort throughout the month of May to help adoptive families. The Sparrow Fund is an organization working hard to provide grants to adoptive families in financial need. These grants help the families enroll in programs specifically designed to provide counsel and comprehensive medical reviews of their referred child. Over 30 retailers have generously agreed to donate 10% of their total sales during the entire month of May to The Sparrow Fund. If you need to buy a special gift for someone, or just feel like treating yourself, please consider visiting these retailers’ sites. Every purchase contributes to someones' dreams! Save 50% - 90% at the best places to shop, eat, see and do in your own neighborhood. New places featured every day. Plus, when refer someone new to Eversave and they buy their first Save, you get $10 in your Save Rewards account. Nomorerack is a daily deal site where you can find your favorite brands for up to 90% off. They hand select 8 items each day that 'go live' at 12 noon Eastern each day. Some items sell out in minutes, so if you want really something, you should order fast. They have a $2 flat shipping rate and I've heard that the credit will work on shipping. Sign up now and get a $10 gift card for a future purchase of $20 or more. 4. Enter the code you got on sign up. Sign up with Ebates today and we'll both get $5 bonus when you make your first purchase!